For the final edition of the MFC Podcast’s ‘Off-Air’ series, the Podcast will be teaming with The Well Society and the Motherwell support to compile the ‘Greatest 25 Motherwell Post-War players. Set for release in November 2017 (exact date TBC in the next few weeks), this publication promises to be the perfect Christmas gift for all ‘Well fans and will follow on from the hugely popular first two editions of ‘Off-Air’. Eighteen-years have passed since Tommy Coyne departed Motherwell after nearly five magnificent years with the club. Over that time the Republic of Ireland international forged the reputation as one of the most popular strikers to have ever played at Fir Park. 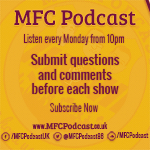 The MFC Podcast makes it’s return for the 2016/17 season. In the first episode of the new campaign Clyde One’s Gordon Duncan joins Busta, Jay and Sparra to discuss summer transfer activity, preview Rangers in the League Cup, new strips, Stephen Robinson’s departure from Fir Park and much more. 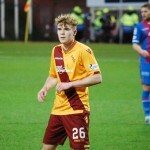 It may sound over the top but the Motherwell U20’s side reaching the final of the Scottish Youth Cup could be a huge turning point for the football club going forward……. 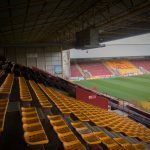 The 2015/16 campaign has been one of mixed fortunes for the Steelmen, with Mark McGhee showing signs of steadying the ship and gradually moving the team away from the relegation zone in the Scottish Premiership table. Looking back on the season so far we can reflect on some great wins (victories at Celtic Park, Tannadice and New Douglas Park) as well as a few disappointments (League Cup defeat at Morton, a hammering at Tynecastle and the shambles at Ross County). Busta, Jay and Sparra reflect on the excellent 3-1 victory over Partick Thistle, look forward to this weekend’s Lanarkshire derby, discuss the latest developments with the ‘Well Society’ and Motherwell F.C. owner Les Hutchison and debate our favourite MFC doubles. Derek Watson joins Busta, Jay and Sparra to cover a wide range of issues in an extended edition of the podcast. Defeat to Inverness in the Scottish Cup, the SPFL investigation into crowd trouble at the play-off game against Rangers, treatment of fans and the cost of Scottish football are discussed in depth. Also covered are our upcoming matches against Killie and Dundee United and this week’s ‘Remember Well’ question.